We had just finished the battle with the dopplegangers from the magic mirror from the prior session. The green dragon called us out that we’d forever remained trapped in the maze. He may, in fact, be right. We shattered the triangle mirror, but we still are in a magical hedge maze that shifts. We decide to use Identify on the glowing orb. It’s part of the network of magic the elves uses to maintain and support the taigh. It has some serious powers against evil and the undead, hitting them as if they got slapped with a 6th level burning hands. When silver light is darkened, innocent’s blood calls out and wakens power. Sacrifice to the Queen of the Wood and the Night, for she will bless her faithful servants. Maud puts her hand on the orb, takes it. Looks at Marcus. “It feels good. Is this good?” She walks up and puts it in the bowl when we say it is good. There’s a crack, the wall to the north dissipates, and yet another chamber without an exit but with a dragon. “Oh, no! It’s Avaria!” cries Maud. Orius bows . . . and touches Marcus, turning him invisible. The dragon wings towards us, and breathes fire. The bard takes 21 HP, others take 42 HP, and Maud goes down on the ground screaming and burning. Marcus runs in behind the dragon, invisible, and hits twice for 36 HP total, expending two spell slots to do that much damage. Those were his last slots, and his healing magic is depleted from the last game. He’s a sub-par fighter now, with two attacks but nothing special beyond that. Hopefully his positioning will allow flanking attacks. We hit the dragon with the Dissonant Whispers spell, and the dragon naturally saves – so takes half damage. Keyar throws down Hunter’s Mark, Colossus Slayer, AND he has advantage. rolls two hits, one a critical. 24 raw damage, and the bonus dice bring it to 38 HP. Now it’s the lizard-men’s turn, because the dragon wasn’t enough. They mob Marcus, but that was a dash, so they don’t get to attack. They’ll likely have a hard time hitting even with advantage (AC 24 goes a long way), but there are four of them. Orius takes aim at some of the lizard men with Burning Hands. They both fail their saving throw, and take 3d6 damage for 8 HP. Alas. Avaria turns in place and attacks Marcus, biting and missing. She flies away, drawing a bunch of opportunity attacks. Marcus pursues, drawing four opportunity attacks (one hits me for 16 HP). Marcus hits twice for an additional 19 HP. The dragon is looking wounded, but dragons are tough. Collin runs up and casts Thunderwave at the clustered lizard men, and rolls descent damage. One succeeds in their CON save, and takes 6 HP, the rest 13 HP, and they get pushed back 10′. And there’s a loud boom, of course. It’s all about the boom. The three lizard men are knocked prone – so any attacks on them have advantage. Keyar casts Hail of Thorns on the dragon along with the arrow shot – and rolls another critical hit. So 26 HP from the first spell-enhanced arrow, and the second bounces. 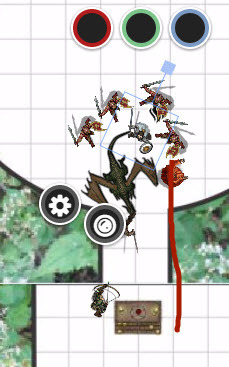 The lizard-men attack Collin and Orius; 3 on Collin and one on Orius. Only one hit on Collin for 11 HP. Ouch, says he. 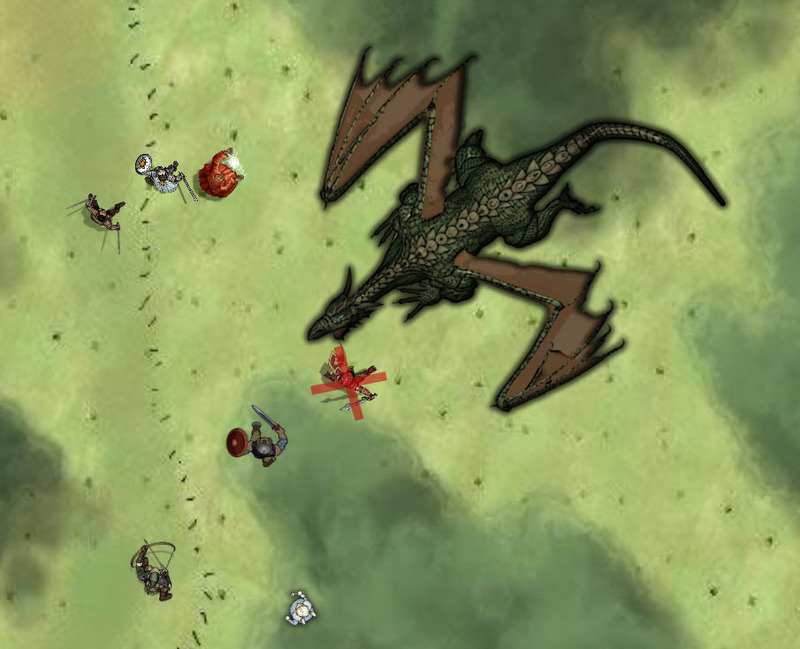 Orius decides that enough is enough, and hits the fire-breathing dragon with a fireball. Which does 8d6. Marcus makes his save, and . . . yow. 43 points of damage, halved to 21. The dragon takes nothing. Because immune. And the breath weapon recharges. So he breathes on Marcus, and he’s at 0 HP and goes down. He makes his first death check. Marcus is about to develop a very healthy fear of fire. Vognur magic missile’s the dragon for 7 HP of damage . . . and she goes down! Collin casts Thunderwave again, hits two, one saves. 10 HP to two, 5 HP to one. The team continues the fight against the lizard men, who are forced to make a morale check. They go running into the briar, save for one that stops next to Orius. Orius casts invisibilty on himself, then comes to Marcus and gives him a potion of healing. “I am SO SORRY,” he says. Marcus wakes up, quaffs another potion, and gives Avaria a coup de grace, killing him. The only foe left on the board is a very determined lizard man . . . 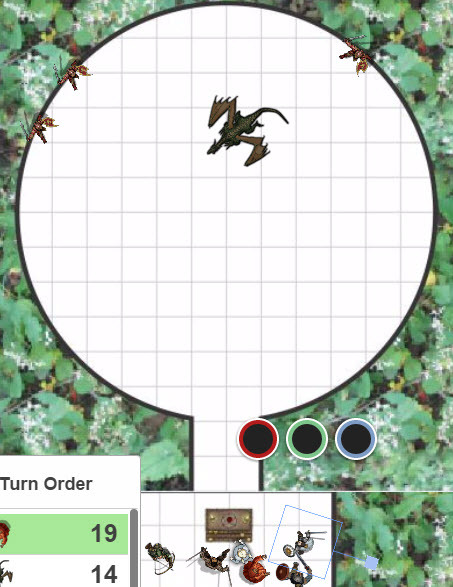 The thorn walls fall away, and we see an absolutely huge green dragon bite the remaining lizard-man in half, digesting him in one fell bite. “IS SHE ALIVE?” we hear shouted in our minds. We figure this 125′ beast is Mori, who’d been imprisoned. The moon orb glows brightly as Maud passes – we grab it and put in her lap. Her skin returns to normal color and heals. Mori says “go to sleep, my child.” The dragon looks ill.
Avaria sought to supplant her, and poisoned her. Mori violated her oath to her god, she asks forgiveness of Keyar the elf. A white moonbeam blazes, and before us now stands a silver dragon. We start chatting with the dragon, who summons now-silvery lizard-men to serve a fine meal, which gives the benefits of a long rest without having to take one. The orcs are many and multiplying. There are forces beyond Pan Calderax and Mori’s control at work here. With her son gone, and Avaria betraying her, Maud was her only source of redemption. We gently ask who Maud is – she’s but a foundling in the village, but with a special quality. She’s destined for other things Mori cannot yet see. As for the orcs, they are being welded together by Darkon the Undead Lord, a foul necromancer welding the tribes together. As hard to forge the orcs together from within as without. After the downfall of Silverwood, Mori considered herself the queen of Dearthwood. One or two tribes of orcs worshipped her, but that was all. It grew tiresome, so Mori controlled over the one tribe, for centuries. Pan Calderax wanted to stoke the dispute between the factinos of humans, by uniting the orcs to wreak havoc on the humans, while he uses Pan Calderax’s control over the city-state of Warwick, far to the north, to conquer. Pan Calderax also rules an evil nation underneath the Majestic Fastness. Pan Calderax exerts direct control over the Majestic Fastness’ area, and is in shapeshifted guise on the council of Warwick, and owns 3/4 of the council outright. It’s a – and he says it – wretched hive of scum and villainy. Dragons do not have true free will. They know their beginning and end, and only through their associations with humans – Maud and Mori, Dracolindes and Alexandros, and Pan Calderax and his minions – do they have choices. Pan Calderax yearns to be free, at any cost, pay any price. When the Black Lord came, legends lost in history, he was the first human to step forward to the island that guarded the entracnce to the abyss. Every dragon had a choice, to stay, or go with the Black Lord to this land. He believes that this way, here in the Majestic Wilderlands, is the right call. Venture to Warwick, and try and remove it from his yoke. The cities are full of refugees from Ossary, which fell apart after the kidnapping of the king and the forces of Nomar split the kingdom in two. There are other possibilities. The repair of the taigh seems intriguing. We’d have to cleanse each taigh center, find a healthy treant to take guardianship, and perform the elvish rites. Once we do that, only a being of the power of Pan Caulderax could breach it. The dwarves, elves, gnomes, and halflngs were split apart for a moment, and in that moment the orcs brought Dearthwood low. We discuss, and decide that healing the taigh is the right call, and other dragons are throwing in behind Dracolindes to oppose Pan Caulderax. 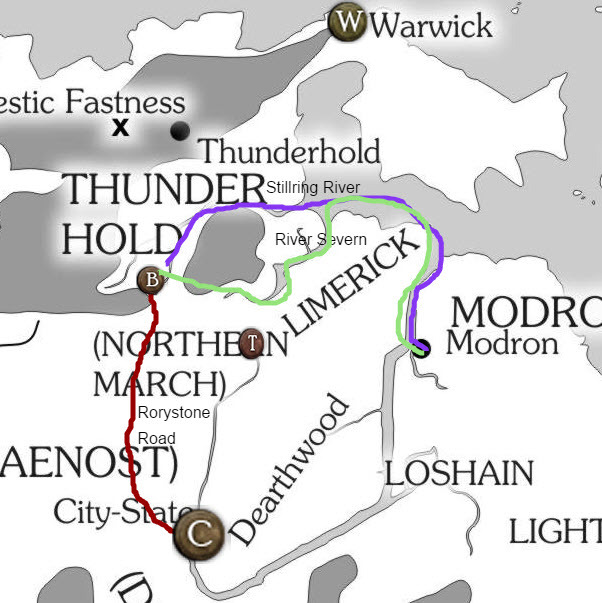 Keyar Nailo (Dan Mc): are there others in Deartwood? Rob C (GM): She mentioned some mage dwelling in a healed Taig (the one with the yellow dot). Keyar Nailo (Dan Mc): other dragons? Rob C (GM): Yes there are other dragon although she feel she is the most powerful. Keyar Nailo (Dan Mc): Isnt “S” an ancient elven fortress? Vognur (Chris): Really nasty storm here — if I go dark, that’s why. Rob C (GM): You feel fear from Mori when she mentions it. We talk for a while, and start to trend to talking to the mages to the South that healed one of the taigh sites. They’re quite reckless and not terribly friendly. Somehow the taigh’s taken a liking to them, though. They are probably fairly neutral to the elves in general. We decide to return to the taigh-site where we threw off the fey lord. We’d bring Maud with us with the Moonstone, because we have a feeling she’s key to things for some reason. We decide to also try and get the elves from the outpost to help recruit treants for the taigh sites. We also ask Mori how she can help, and also if there is any loot around. Mori is almost offended that we would doubt that she knows where the loot is. We end there. Our achievement is balanced by the dragon ally . . .but we still rack up 3,500 XP each. YOW. For treasure, we harvest Avaria’s body, at Mori’s behest. 1000d dragon blood, 500d dragon teeth, enough scales to make 2 suits of AC 20 dragon armor, and 10 VIZ. That would be dragon scale armor – heavy armor. There’s also a dragon horde that will be detailed later. Woot for loot. 17,000d, 1,800 crowns (worth 576,000 silver pieces! ), 6 gems worth 1000d each, horseshoes of a Zephyr, potion of longevity, and potion of supreme healing. 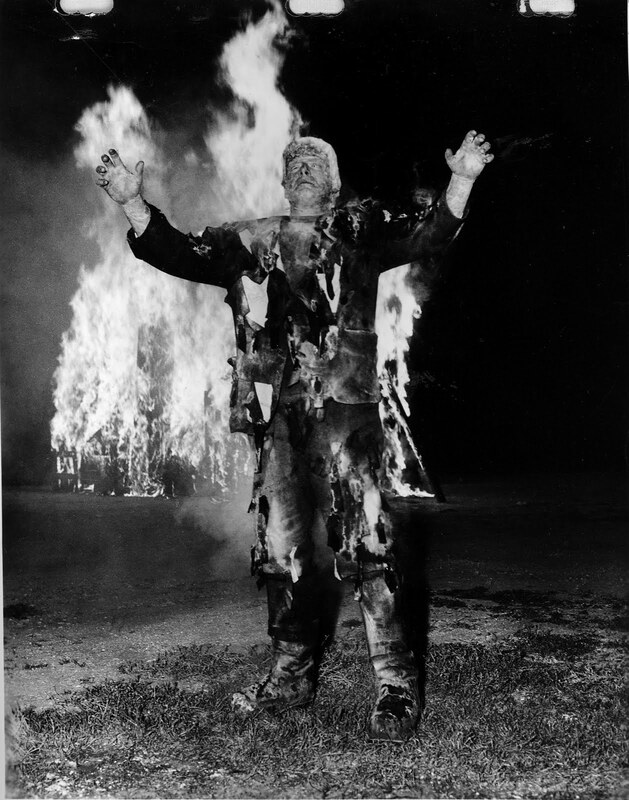 That picture is exactly how I imagined Marcus after the friendly fireball, lol.